Due to the large undergraduate graduating class this semester, we were unable to honor additional ticket requests for the May 2014 commencement ceremony. While we recognize the significance of this occasion to you and your family, as well as to the entire University community, Edinboro University also recognizes the importance of safety in all our buildings. We must comply with the requirements determined by the Pennsylvania Department of Labor and Industry regarding the capacity of McComb Fieldhouse. Your guests are welcome to watch the ceremony in the comfort of the SCOT Cinema or the Multipurpose Room, both in the Frank G. Pogue Student Center. These two venues provide air conditioning and, in the cinema, theatre-style seating. They are ideal locations for small children and those who have difficulty sitting in or climbing the bleachers. The ceremony also will be streamed live through the Internet. 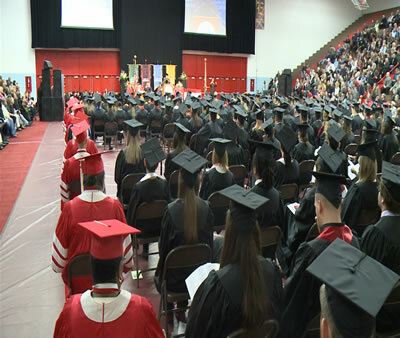 Please see Edinboro University’s home page, www.edinboro.edu, the day of the ceremony for the appropriate link to view the commencement. There are important differences between graduation and commencement with which you should be familiar. Graduation is a two-step process consisting of applying for graduation by submitting a Graduation Card, and completing all academic requirements for your degree. The administrative process of degree conferral will indicate your official date of graduation. Commencement, on the other hand, refers to the ceremony, officiated by the President of the University, where you share the excitement and importance of your academic accomplishments with peers, family, and friends. It is also a time for the University, Council of Trustees, senior administrators, and faculty to pay special tribute to you for the outstanding efforts you have shown in earning your degree. GRADUATION CHECKLIST Designed to take you through the necessary steps prior to graduation. Click on the checklist to obtain the graduation card. To avoid a late fee your graduation card must be submitted by the end of the add period for the respective graduation semester/session. All late fees are $100. To participate in spring commencement, you must submit a graduation card. Both undergraduate and graduate students must submit a graduation card. GRADUATION FAIR - Tuesday and Wednesday, April 22 and 23, from 12:00 pm to 6:00 pm. Stop by the Pogue Student Center to check off many of those graduation tasks on your to-do list. Please click on the above link and tell us about your future plans. You will be directed to a survey, and it will only take a minute or two to complete. The survey is being administered to graduating seniors as a component of the Voluntary System of Accountability (VSA) College Portrait Program. The VSA is an initiative by public 4-year universities to supply basic, comparable information on the undergraduate student experience to important constituencies through a common web report- the College Portrait. More information on the Voluntary System of Accountability™ (VSA) College Portrait Program can be found by clicking the VSA link.